Advisory ARF - An Innovative Post Retirement Investment Solution. 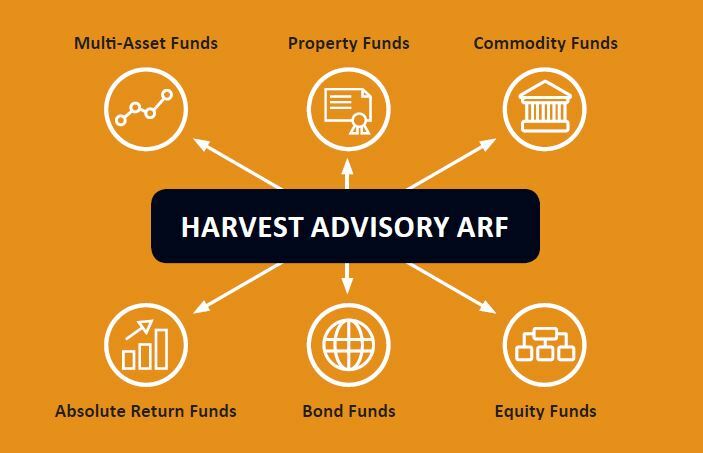 The Harvest Advisory ARF is an innovative post retirement investment solution. 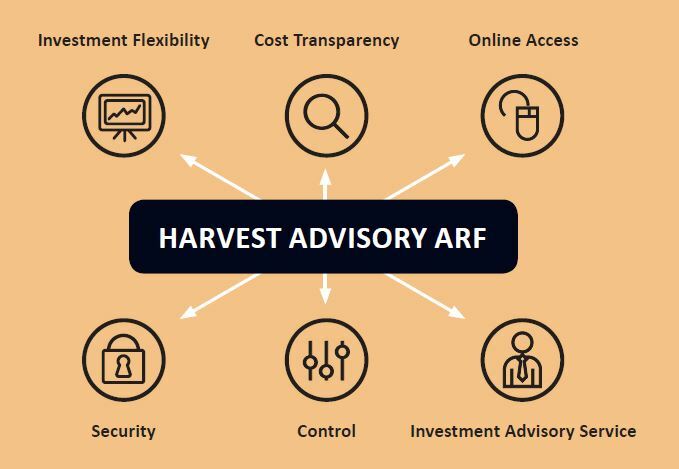 The Harvest Advisory Approved Retirement Fund (ARF) offers a transparent, cost-effective and client-centric investment platform with access to funds at institutional rates with online valuations. With over 25 years of experience, Harvest’s Investment Advisory Service will provide you with active guidance through the process of identifying your unique investment profile and implementing your ARF investment plan to help you enjoy a financially secure and comfortable retirement. An ARF is a post retirement fund which allows you to keep your pension pot after retirement, withdraw an income and invest your ARF in a variety of different asset classes. You can withdraw a retirement income from your ARF as required, subject to a minimum withdrawal each year once you are age 60 for a whole tax year. On death any balance remaining in your ARF can pass tax free to your spouse’s ARF or is payable to your estate where it will be subject to applicable statutory deductions and/or inheritance tax. • on death, your Harvest Advisory ARF can pass to your estate. • Your advisor will help you understand your risk profile and will identify your investment objectives with you. • Your advisor will work with you to identify investment solutions tailored to your unique needs and goals. • You will be notified of new market opportunities and gain access to quality investment ideas. • Your advisor will regulary review your investments with you in the context of market developments, your investment plan and any notified changes to your investment objectives. Our Investment Advisory Service provides you with active guidance through the process of idea evaluation, identification of the right solutions for your unique profile and implementation of your ARF investment plan. Your ARF is an important source of retirement income. The Harvest Advisory ARF allows you to invest in a wide range of asset classes, offering the potential for your post retirement fund and income to grow and continue to meet your changing circumstances over time. Based on an assessment and analysis of the information you provide, your advisor will consider investments from our list of recommended funds designed to optimise the returns within your portfolio. The required annual distribution from an ARF is 4% for individuals with combined ARF and vested PRSA assets of less than €2 million and who are between 60 and 69 for the full tax year; 5% for individuals with combined ARF and vested PRSA assets less than €2 million and who are aged 70 or over for the full tax year, and 6% for individuals with combined ARF and vested PRSA assets more than €2 million and who are 60 or over for the full tax year. There is no ‘one-size-fits-all’ solution to retirement planning. Each client will have their own unique needs and objectives. Contact us on 01 237 5500 or at justask@harvestfinancial.ie to arrange an initial meeting with one of our advisors. On of our advisor’s will guide you through the options available to help you secure the income and lifestyle you wish to enjoy in retirement. For more information about our approach to advising clients on their retirement income please see Harvest’s Guide to Retirement Income and our Investment Advisory Service. If you set up an Approved Retirement Fund or an Approved Minimum Retirement Fund you may lose some or all of the money you set aside for retirement. The value of your investment may go down as well as up. The income you receive may go down as well as up. Unless the remaining capital grows at a rate at least equal to the rate of regular withdrawals, the investor’s capital will be reduced and could eventually be exhausted. This marketing material is not intended to provide advice and is provided for general information purposes only. The legislative information contained herein is based on Harvest’s understanding of current practice as at September 2018 and may be subject to change in the future.